God, thank you for all of these who have been called according to your name and who love you. And I pray that you would lay a great path before them. Lord, let them dedicate their lives to you more and more. Let them seek you out more and more. Lord, I pray that they would trust you for the outcome of every ministry. Lord, we thank you so much for allowing us to partner with them. Lord, we are delighted and excited for how you are going to be working through them. In Jesus’ name, Amen. I want to share with you today about a truth that I wish had been stressed more effectively to me when I launched into ministry over twenty years ago. I thought then, as I am tempted to think now, that because I loved God and because I was passionate about ministry and because I was called into this wonderful thing called ‘church life’ (or ‘ministry life’)… I thought that everything should just work out as I expected it to work out. I thought that everything would work out like Romans 8:28 says it should: To those who love God and are called according to his name, everything will work out… At least that’s how I liked to translate it. So early on in ministry I thought that if I followed after God with all my heart and all my soul and if He called me into the right settings, that life would be smooth… that ministry would be productive… that my family would be perfect… that my heart would be always encouraged… that people would always agree with me… that church members would always get along… basically that everything would work out as I expected. Romans 8:28 became such a motivator for that idea. It should all work out, right? But I was failing to see the outcomes in the midst of the circumstance. A few verses before 8:28, in Romans 8:26, Paul basically says, “Hey, I know you are in some distress right now, dear Romans.” The idea of all things “working together for the good of those who love God” was written in the context of distress. After Romans 8:28, Paul has this whole section which we love because it talks about us being ‘more than conquerors’ and how ‘nothing can separate us from the love of God’ – but we have to ask “Why does Paul have to say these victorious things?” It’s because they have moments where they feel defeated, where they feel separated, where they are going through hard times in ministry while following God, where life is really rough in Rome. And did you notice that there is a reference to ‘death’ in there. You know, nothing can separate us from the love of God – not even death – and we’re like “Yes! That’s so cool!” but we forget that we still have to experience death. We still have to go through death to know that death can’t even separate us from God. 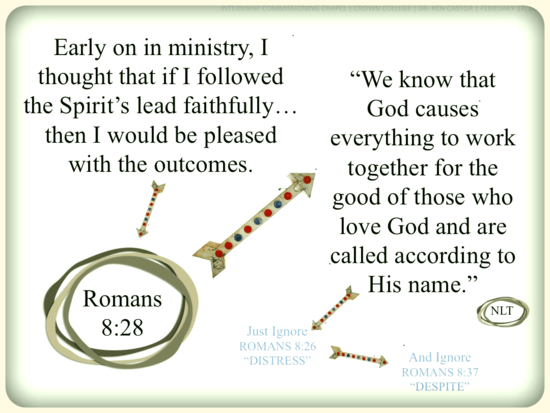 The concept of Romans 8:28 has to be worked out in its context.